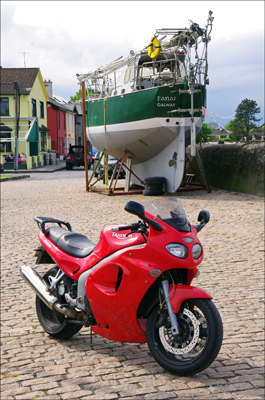 My old Triumph Sprint at Kinvarra, Co Clare. One of my major passions is motorbikes, and Triumph Motorcycles in particular. Although the company itself falls shy of claiming they are the oldest maker in existence (it’s a debatable point) there is little doubt that they hold a proud heritage and are instantly recognisable as the British motorcycle manufacturer of the present day and, for a large number of people, the only serious one in living memory. Unfortunately, it is not just the particular models they built that they are famous for but also their chequered history in that dark era of British industry that was the sixties and seventies. Struggling with old machinery and even older designs, they finally went bankrupt in 1977, only to resurface as a rather novel experiment in British industrial history, a government backed workers cooperative. This to failed, in 1983, for a myriad of reasons, not least of which was the lack of investment and development. The name and designs were subsequently bought at auction by a midlands based house builder by the name of John Bloor, a man who had genuinely raised himself up in the world from a plasterers mate to the head of a very successful company with a multi-million pound turnover. Having purchased the rights, and the old Meriden factory (upon which he built a new housing estate) he set about recreating the motorcycle company from scratch. Again, he enjoyed great success and in 2013 they produced more than 50,000 machines in their factories at Hinckley and Thailand. This, by the way, was greater than Triumph had ever achieved before, even in their post war heyday. The European and American markets for new bikes is both saturated and very competitive, so Triumph looked east, to India and Asia generally. A new factory was proposed and all sorts of plans were laid to start producing a quarter of a million bikes a year based around a single cylinder engine of 250 -350cc. This was never admitted officially until the time came in 2014 to abandon the idea altogether. Likewise, the company had looked to the US and Canada and had seen the growing market for ‘side by side utilities’, or dune buggies with a purpose, to describe then in European terms. This was another project that they kept rather quiet about with the only indirect evidence being the recruitment of engineers via Facebook of all places. Equally as quietly, this venture also seems to have passed away with their web presence disappearing and at least two of those engineers finding new jobs outside of the group this autumn. As rum a situation as this may be it would surely not affect the core business of producing well engineered and respected motor cycles, or would it? The answer is certainly not something that Triumph are publicly discussing but there are worrying signs from which a rather unflattering picture may be formed. The first point to note is that no brand new models have been announced for the last couple of years and none appear to be in the pipeline. Certainly, there have been updates and revamps but nothing fresh off the drawing board. BMW, on the other hand, are reporting growing sales and three new model launches this year while KTM are mixing and matching various parts to enlarge their Indian built ‘Baby Duke’ range. Both these companies are expanding in areas where Triumph wanted to be. Meanwhile, three of the big four Japanese companies are experiencing growth this year, with just Suzuki trailing, and even Harley Davidson is happy with its lot in the US. Ducati have also enjoyed an enthusiastic welcome for their new Scrambler, a platform around which they will be building a range of leisure rather than sports bikes. Amidst all this excitement Triumph, at this years major show in Cologne, pointed to new paint schemes on the Bonniville as being a highlight of their display, a range of bikes that is 14 years old! I do hope all is well at Triumph but there does seem to be something rather amiss, a lack of progress and an air of stagnation seems to be enveloping the company. Even their product manager, who was all over the media promoting the bikes a while back, now lists his position there as ‘previous’ on social media. It was exactly a year ago that they were trumpeting aloud the record number of bikes produced, by contrast, the latest press release listed on their site for this year is devoted entirely to a new riding jacket! The sense of deja vu is palpable as, just like the old company, the new Triumph chases down dead ends, misses opportunities and fails to develop modern products that customers will want to buy. I do hope I am wrong, I have two Hinckley built Triumphs in the garage both of which I love riding and I was looking forward to future models that would answer my desires and enthusiasm for the marque, but now I am not so sure that it is ever going to happen. This entry was posted in Uncategorized on December 12, 2014 by Triplemanr.